Hurry, Only 7 Left ! In the range of new products designed to cater to all your home decor needs at @Home furnishings, the Abstract Square Table Lamp is fast gaining popularity. 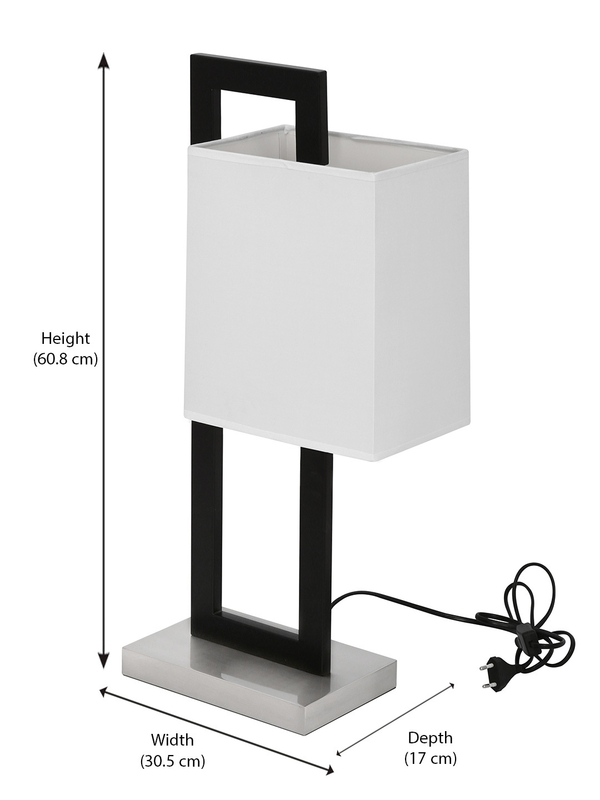 The abstract square table lamp has an abstract and geometric structure, with a height of 60.8 cm. The length and breadth of the product is 30.5 cm and 17 cm respectively. There is an iron frame which is rectangular in shape. The lamp is shaped in the form of a square and is suspended towards the top on the right side of the rectangular frame. The frame is made of metal whereas the lamp is cut out of fabric. The materials used guarantee the durability of the product. In addition to this, there is a power cord attached to the product which needs to be connected to a power source.Lamps are an important aspect of modern home. Abstract designs, especially geometrical patterns merge well the edgy design of modern interior designing. Place the lamp on any table top, be it your living room, dining room or bed room to accentuate the style quotient of your home. However, the lamp requires electricity to run and needs to be placed within the range of a power source.